Niki Jabbour - The Year Round Veggie Gardener: I love Seedy Saturday!! 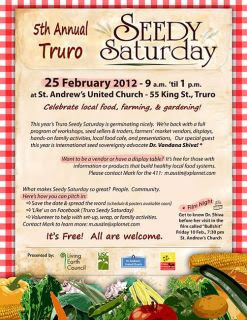 Click here to visit the facebook page for Truro Seedy Saturday coming up on Feb 25th at St Andrew's United Church. Brenda mentioned your book launch in her post today. Congratulations!!! I am really enjoying your book. I'm definately going to carry it in my store.